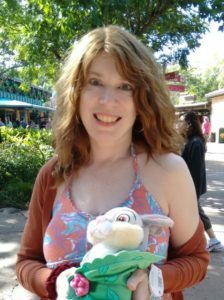 I thought that dinosaur toys for kids would be a popular item to write about, since most kids go through a phase where they’re crazy about dinosaurs. It’s not hard to see why they do. They seem like something from a long tale or a mythical land … but they’re real. They’re scary, powerful, and huge … but they’re also safe, because everybody knows that they all died out a long, long time ago. 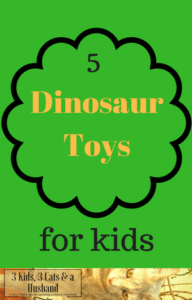 Does your child like a lot of variety in their dinosaurs? Then check out this set of twelve dinosaurs in different colors that includes T-Rex, Tyrannosaurus, Stegosaurus, Triceratops, Apatosaurus, Ceratosaurus, Spinosaurus, Pachycephalosaurus, Parasaurolophus, Brachiosaurus, Styracosaurus, Velociraptor, and Euoplocephalus. Each one is about four inches high, so they are not ridiculously small, but great for traveling and perfect for tucking into a diaper or travel toy bag. They are durable enough for playing with outdoors as well as inside. This would also be a great choice for times when you need little toys to give out to a group of kids, such as party favor bags or prizes for games at group settings. When you turn this stegosaurus on, it starts walking and moving its tail, complete with a roaring sound and flashing multi-colored lights on its spikes and eyes. There is no volume control, but if the sound drives you crazy, you can muffle it somewhat by simply putting tape over the speaker. Here’s a clever toy that has a bit of a science lesson element to it. The kit contains three “magical” eggs that, when placed in water, slowly hatches and turns into a Stegosaurus, Apatosaurus, or Spinosaurus within 24-36 hours. 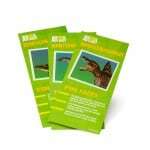 Each dinosaur comes with a fun fact card with interesting information about it. I could see these eggs providing a great activity for young elementary school classes or homeschooling families. Kids could keep track of the progress every couple of hours, taking photos, making drawing, creating charts, and putting it all into a journal. One reviewer also said the eggs added a nice touch to their kids’ Easter baskets. Here’s a good, old-fashioned large stuffed dinosaur. It’s thirty-two inches tall and has posable arms and legs, so it can be adjusted to stand up by itself. At the same time, it is quite soft and huggable. This toy is recommended for ages three and up, but I can’t imagine why it wouldn’t be unsafe for a two year old. It might just be a little too big for them to play with it easily! This attractive toy box comes with two five-inch dinosaurs and claims to be big enough to hold a total of 160. The lid attaches with two velcro straps, and there are also handles on the sides, making it easy to carry. One particularly nice feature is that it upzips to create a decorative play mat for a child’s dinosaur adventures. Which one would your child like the best?